The author himself might not have stayed at the St. Tudno hotel, but the inspiration for the central character of his world-famous book Alice in Wonderland certainly did. Visiting the St Tudno Hotel with her parents during Easter 1861, eight-year-old Alice Liddell would already have known the shy Oxford don, Charles Lutwidge Dodgson (Lewis Carroll). Indeed, two years later the story that would change children’s literature would be written after a boating trip on the Thames. 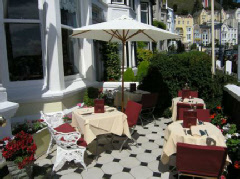 Today, the St Tudno is a respected boutique hotel which has been operating under the same family management for four decades. It boasts an award winning restaurant – The Terrace – and an indoor swimming pool. Its 18 guest bedrooms include the Alice Suite and the Lorina Room, while its public rooms such as the Coffee Lounge and bar feature some fine Victorian detail.